This weekends estate sale is not to be missed. Antiques, Collectibles, Uniques and Jewelry like you've never seen before. Come see where Stevie Nicks of Fleetwood Mac bought her custom designed crocheted clothing. 100's of unique vintage pieces to choose from. This is an incredible one of a kind estate sale. 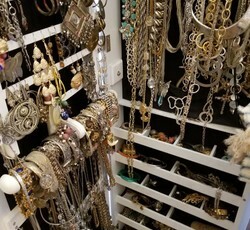 100's of pieces of jewelry - Sterling Silver, Fine Jewerly, Costume & Amazing Unique Pieces. Eisenberg, Roco, Mariam Haskle. WOW.....a whole room dedicated to jewelry even 6 large jewelry armoires. Furs of all kinds, closets full. Collectibles from A to Z....Fun, unusual eclectic mix of interests. Antiques - Hoosier, kitchen cupboards, piesafes, bin tables, beds, wicker, dressers, tables, organ, great stuff! Kitchen - retro, funky pieces, pottery, fiesta, baskets, copper, tools, yard art, rusty gold. Refrigerator, washer, dryer, collectible laundry room items. Vintage clothes, linens, crocheted collection of unique pieces, quilts. Dolls, cradles. Pram and Americana. Super fun sale! You just won't believe this sale. DON'T MISS IT! !